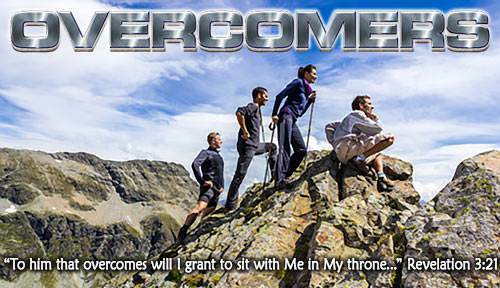 I am in Christ!—Lesson 5 in "Overcomers"
Lesson 5: I am in Christ! When God looks down, He sees two families in the world. He sees the family of Adam and the family of Christ. Adam is the head of all who are in his family, and Christ is the Head of all who are in His family. If I am in Adam's family, God sees me as being in Adam. If I am in Christ's family, God sees me as being in Christ. God sees me as being in Adam or in Christ. He sees you as being in Adam or in Christ. 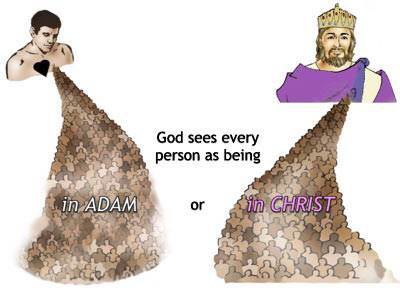 God sees every person as being in Adam or in Christ. What does it mean to be in Adam? To be in Adam means to share in all that Adam did and all that he was. Being in Adam means you are separated from God, in Satan's kingdom of darkness, and under God's judgment. How terrible! God put me in Christ. By natural birth we are all in Adam's sinful family. We are all in Adam. That is why the Lord Jesus said, "You must be born again." We must be born again spiritually to get into Christ's family. How did I get into Christ? God put me there! I could never do this myself, but God did it for me. 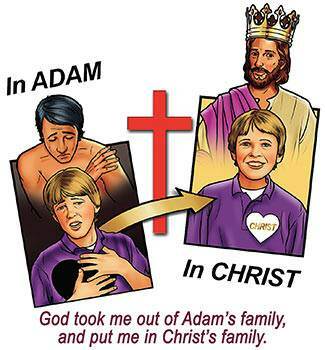 By His mighty power God took me out of Adam's sinful family and put me into Christ's family. He put me in Christ. The most precious phrase in the whole Bible is the little phrase in Christ. Over and over again, the Bible speaks of those who have trusted Christ as their Savior as being in Christ or in Him. God wants His believers to know that they are in Christ! To be in Christ means to share in all that Christ did and all that He is today. To be in Christ means that I have a new "position" before God. I am loved and accepted by God because I am in Christ. The moment I took Christ as my Savior, God put me in Christ. I am no longer in Adam; I am in Christ. I will always be in Christ. That is the way God will always see me—in Christ. How wonderful! God wants every believer to know that he is in Christ. Go back over these verses and take your pen or pencil and underline the words that speak of our being in Christ or in Him. Underline them in your Bible. As you read the New Testament, you will discover that these words are used many times. In fact they are used over 130 times in the New Testament. God wants me to know that I am in Christ! Because I am in Christ, God has forgiven me of every sin. The Bible says, "In whom [in Christ] we have redemption through His blood, even the forgiveness of sins" (Colossians 1:14). I am made near to God. We all like to be accepted by our friends and others, but being accepted by God is the most important acceptance of all. Christ is "the Beloved," God's dearly loved Son. I am accepted in Christ. What does it mean to be "accepted in Christ"? It means that God loves me and accepts me in the same way that He loves and accepts His own beloved Son. I am "accepted in His beloved Son." Once there was a beautiful young girl who lived in a far country. Her family was very poor, and she did not have a bright future. One day she decided to leave her home and go to another country to be a servant in the home of a wealthy man. This man was very rich, and his home seemed like a palace to her. He was good to her, and she worked hard to please him. This wealthy man had a son whom he loved very much. In time this son fell in love with the beautiful servant girl. She loved him also, and one day he asked her to be his wife. 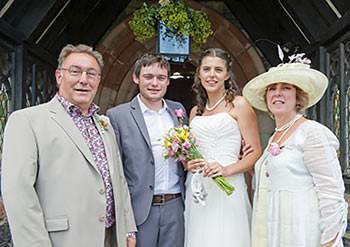 The father was pleased that his son had found the girl he wanted to marry. One day the son and the servant girl were joined in marriage. Suddenly everything changed for this young girl. She was no longer a servant, but she was accepted in the family of the wealthy father. Why was she accepted? She was accepted because she had become the wife of the beloved son. She was "accepted in the beloved son." This is a picture of what God has done for me. I was once in Adam. I had no hope and no future. But one day I took the Lord Jesus as my Savior, and everything changed. I am now accepted perfectly by God. Why am I accepted by God? 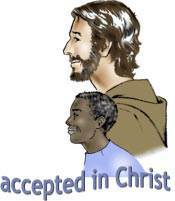 I am accepted because now I belong to Christ. I am accepted in Christ. God has made me "accepted in the Beloved." I have a new position. My "position" is the way God sees me in Christ. Before I took Christ as my Savior, God saw me as being in Adam. That was my old position. Now I have a new position in God's sight. God now sees me in Christ. He loves and accepts me in the same way that He loves and accepts His own beloved Son. Can I lose my position in Christ? No, I can never lose my position in Christ, but there is something I can lose. I can lose the enjoyment of my position in Christ. If I am disobedient to God and keep doing things that displease Him, I will lose my joy. Because of His great love for me, God has done something for me that I could never do for myself. He has taken me out of Adam's family and put me in Christ's family. I am now in Christ. Because I am in Christ, God loves me and accepts me. I am accepted in His beloved Son. "Father, I believe that You have put me in Christ, and that I am loved and accepted in Him. Help me to love You and obey You always so I can enjoy this wonderful new position which You have given me."